We went to collect more wood for firewood today (after our little run of guests it is time to get back to work!). I was surprised to find a variety of mushrooms growing on various stumps and logs; perhaps the relatively warm and moist air we have been having recently has fostered mushroom growth. I saw bunches of various little brown mushrooms (common in spring and summer) and shelf mushrooms that look like scallops (these grow year round), though neither are edible. This beautiful shelf mushroom caught my attention; it covered the cut end of a large oak stump...the detail of is exquisite...the ripples reminded me of a flamenco dancer's skirt! Up close it looks soft enough to pet! But the big surprise of the day was the Chaga mushrooms! As we were heading back down the mountain with our trailer full of wood, I was looking into the trees for birds nests (it's one of the things really appreciate about the bare trees of winter...I can see all the birds nests everywhere), and I spotted an area that had strange growths on the birch trees. I shouted to Johny over the sound Bear's motor (our ATV), "stop, stop here! ", "what" he says, "I think I see Chaga mushrooms! "...now I have his attention. So we stopped, and Mountain Man went and investigated. Sure enough, we discovered a place with lots of Chaga mushrooms. Chaga mushrooms are known for their medicinal properties, particularly for strengthening the immune system and it is said to be a cancer preventative. 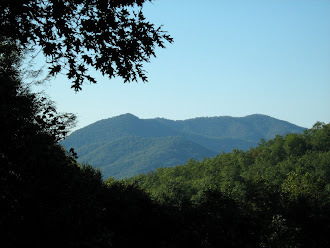 Here are two sites with more information, click on the link if you want to learn more: Alan Muscat is a well know mushroom hunter in Western NC (Johny has hunted with him and respects his mushroom knowledge) and Chaga Mushroom Guide. There are many more, but we liked these two. Looks like we have our own source of these wonderful medicinal mushrooms. Now we are studying...learning all we can about them at the moment; perhaps this will be the newest addition to our daily health regimen! POST SCRIPT...we have since learned that this is NOT Chaga. Those are fungi growing on cherry trees...so even though we are disappointed that we have not discovered Chaga, we are pleased to have discovered that we have cherry trees, these in particular are great for making jam! Behind every cloud is a silver lining. Hugs! So true dad! Hugs back!